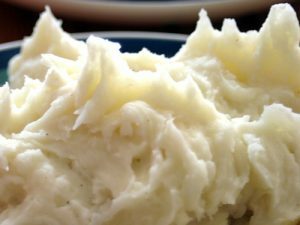 These make-ahead mashed potatoes are super tasty and great to have done prior to the day of a big meal. Peel, cube and cook the potatoes. Drain well and mash until smooth. Add cream cheese, sour cream, seasonings, and butter. Beat all with a hand mixer until smooth and fluffy. Bake at 350•F until heated through (about 30-45 minutes) and serve.